Single Stud w/ SS "O" ring - 4,000 lb. * capacity rating. This fitting fits all aluminum tracking similar to the track in the image above. Single stud refers to the number of "fingers" that it captures when attached. The fittings' aluminum base will not rust. It is SPRING LOADED to permit simple attach and detach operation. To detach, simply pull up on the spring loaded mechanism and then slide forward or back and the fitting releases. To attach, rest the fitting in the load track, then push down on the base and push forward. The single stud fitting attaches to one set of "fingers" in the load track. For a stronger and more secure fitting consider triple or double stud fitting. IT IS NOT recommended to pull at an angle greater than 45 degrees. As a rule of thumb you lose about half your rating at a 45 degree angle. *RATED CAPACITY: Also known as assembly capacity or break strength is the minimum load a complete assembly can withstand before failure in a laboratory pull test when the product is new. WLL The maximum load weight a tie-down should be subjected to during normal use. To assist in making the proper tie-down choice the Federal D.O.T. requires the W.L.L. to be 1/3 of the Rated Capacity. 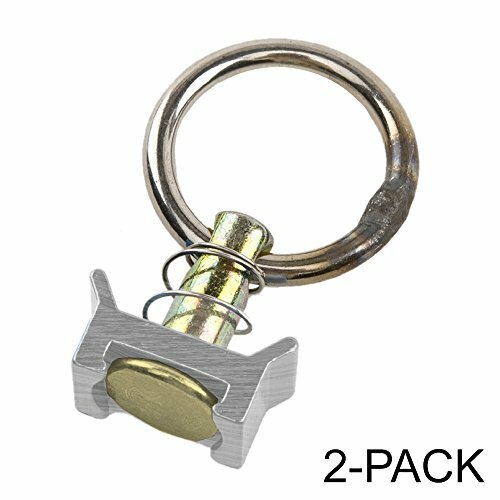 This listing is for two (2) single stud fittings with a RATED CAPACITY* of 4,000 lbs. The W.L.L. ** (working load limit) is a 2,166 lb. capacity. This fitting fits all aluminum track that is similar to the track shown in the secondary image above. We refer to the track as aluminum load track. It is also commonly referred to as airplane track, seat or simply S track. *RATED CAPACITY: Also known as assembly capacity or break strength is the minimum load a complete assembly can withstand before failure in a laboratory pull test when the product is new. **W.L.L. The maximum load weight a tie-down should be subjected to during normal use. To assist in making the proper tie-down choice the Federal D.O.T. requires the W.L.L. to be 1/3 of the Rated Capacity. The fitting is SPRING LOADED to permit simple attach and detach operation. To detach, simply pull up on the spring loaded mechanism and then slide forward or back and the fitting releases. To attach, rest the fitting in the load track, then push down on the base and push forward. Single stud refers to the number of "fingers" that it captures when attached to the aluminum track. The base measures 1-3/8" long x 3/4" wide with a 3/16" diameter stainless steel ring that measures 1-3/8" on center. The fittings' aluminum base and stainless steel ring will not rust. The steel stud/center post is zinc plated to inhibit corrosion. If you have any questions about this product by Fittings for Aluminum Track-Multi Packs, contact us by completing and submitting the form below. If you are looking for a specif part number, please include it with your message.